The latter can look a lot like the former, especially when all there is to see is the aftermath. All of us want to keep our friends alive, and the newest safety initiative uses the moniker of “loss of control (LOC).” The popular belief is that LOC is synonymous with stall/spin, and the popular panacea is visual angle of attack indicators. But, in fact, low-speed spirals (different from high-speed spirals taught as part of instrument training) can masquerade as and be as vicious as inadvertent spins. Here’s the story of how this was discovered. Three years ago, the Experimental Aircraft Association announced the Founder’s Innovation Prize with a goal of reducing LOC accidents by 50 percent over 10 years, I, like nearly 200 others, started thinking of how to win (and spend) the $25,000 first prize. Maybe half of that first year’s submissions were about ways to measure or indicate angle of attack, but I started with exhaustive research, including a tedious and brain-numbing analysis of 551 NTSB reports on RV-series experimental, amateur-built aircraft events. Sure, stall/spin accidents were prominent among the fatalities, but there were interesting observations along the way. For example, in the NTSB reports, the reported phase of flight was often irrelevant to the event, inconsistent with the narrative or missing. And one prominent alphabet organization considered flying into wires when buzzing to be a loss of control. In other words, the data and the reports could not be taken at face value. Also interesting were some of the accident mechanisms. In nearly half of the runway excursions (off the side of the runway on landing), the approach was in trouble longitudinally (bounces, approach angle, etc.) before the airplane departed the runway. This observation eventually evolved into the observation that the motor skills of controlling the airplane are four: pitch, power, roll and yaw. My current working definition of LOC is the failure of the pilot, for whatever reason, to adequately and simultaneously control all four. But why does LOC occur? IMSAFE, distractions, task saturation and similar are obvious suspects. Noted general aviation safety analyst Ron Wanttaja distinguishes between failures in pilot judgment and in skills. Dr. Bill Rhodes has started many of his safety talks by asking for a show of hands of how many in the audience lost a friend in a small plane crash, and then how many were not surprised that the pilot killed himself. Typically, half the audience was not surprised. The takeaways are that the goal of a 50 percent reduction in LOC accidents is unrealistic and that general aviation safety is much more of a marketing issue than it is a technical issue. But the four-motor-task definition of LOC and the marketing observation led to the current thinking: the most feasible way to reduce LOC accidents is to improve pilots’ flying skills, and the way to do this is by making those skills fun, rewarding and challenging to acquire. After all, nobody thinks that the FAA’s Five Hazardous Attitudes apply to them. Frustrated and highly motivated by failing to even make the finals of the EAA contest in the first three attempts, I dove into finding rewarding and challenging ways to improve pilot skills. Like others, I’d observed that over the decades that pilot and CFI skills and knowledge have declined and that current training focuses on high proficiency in the middle of the envelope, where accidents don’t occur. And the newest Airman Certification Standards eschew stalls, apparently preferring that a pilot first sees an actual stall break with a plane full of passengers, not safely at altitude with a CFI. Another untoward but fortuitous circumstance was that I’ve had three spinal surgeries in the past five years, and the mere mention of the word “aerobatics” distorts the surgeon’s face. So instead of looking at upset training and spins, aerial maneuvers that would require more than 2Gs or more than 60° of bank, I started looking at exercises that could be done in just about any plane, such as a Cessna 172 or my non-aerobatic RV-9A. These Expanded Envelope Exercises (3E) differ from maneuvers in that they don’t necessarily have completion standards, but, rather, their purpose is to expand the pilot’s comfort zone so that the pilot can handle an imminent LOC situation as not a big deal, rather than panicking or freezing at the controls. Each exercise exposes the pilot to some combination of a highly dynamic flight situation, new kinesthetic sensations and very high workload—ingredients that can overwhelm a pilot and lead to LOC. 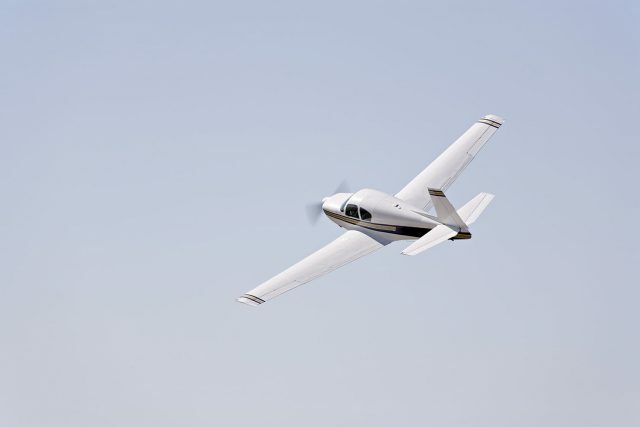 While all of the exercises so far have proven easy enough to perform on the first or second try, they are unusual enough that they should only be attempted with a CFI who has seen these exercises before. I almost found this out myself the hard way. 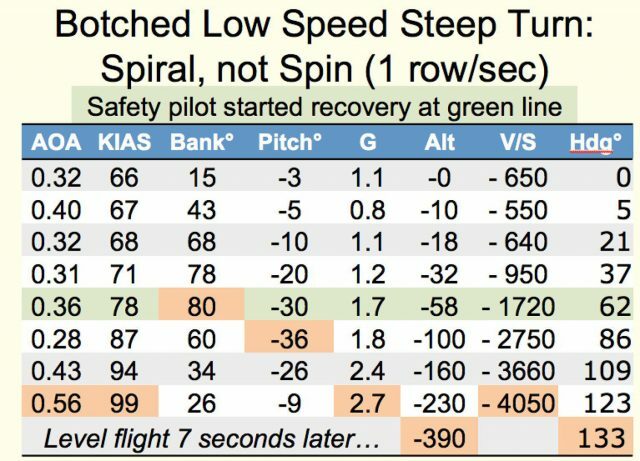 One exercise involved steep turns at low airspeeds. (Lest I tempt anybody to go out and try something over their head, I won’t be any more specific in the description). I’d done this without a hint of a problem in the RV-9A, but then one subject pilot botched the maneuver, and we were very quickly in a steep spiral. Before we could complete the “my airplane, your airplane, my airplane” positive change of controls ritual, the airplane was at 80° of bank and 30° nose down—pretty exciting! And even though I’ve taught basic aerobatics, I was overwhelmed by a windshield full of Georgia marshes coming up at me. The flight data downloaded from the Garmin G3X Touch system indicated that we were in a genuine spiral, and despite my fairly prompt recovery, we lost almost 400 feet. Had this happened turning base to final, every accident investigator in the world would have classified it as a stall/spin. And, depending upon the circumstances, the impact signature of a spiral and of a spin may be indistinguishable. This event also suggests that many historical stall/spin accidents may have been misclassified! Vertical speed reached an impressive 4,000 feet/minute down. Part of my research included looking for stall/spin videos on the web. I found two that were definitely spins, but what’s really interesting is that both of those spins were entered when the plane was already out of control in a steeply banked, nose-down attitude, similar to a well-developed spiral. In other words, inability to recognize and recover from a spiral resulted in the spin. Would I like to win the $25,000 prize next year? Of course! Both my ego and bank account encourage me to keep trying. But regardless of any contest results or who gets the credit, the work must continue, as the more important goal is keeping our friends alive. Ed Wischmeyer, ATP/CFII, has flown well over 150 makes and models of general aviation aircraft and published hundreds of pilot reports, articles and columns. His Ph.D. is from MIT. Several years ago I experienced a similar excursion from my ‘normal’ and expected flight envelope. I was in a 30 – 40 d descending bank while turning base to final at 70 mph. The nose dropped while my bank suddenly & unexpectedly steepened. As you described, the windscreen filled with dirt and the ASI rapidly wound up. This was before iPads, apps, Stratus, and GPS so I have no record of my actual parameters. I leveled the wings and pulled out of the dive with 3+ g’s of LF… and obviously survived the experience. It took me several years to realize I had entered a step spiral. The overbanking tendency of my steep turn, along with the tendency for the nose to drop as the lift vector perpindicular to the earth reduced snuck up on me. I was really surprised by the rapid transition from ‘normal’ to near LOC flight.